We explore the intramolecular Friedel-Crafts reaction in this post. But first, a very quick refresher on intramolecular reactions in general. Here is an instant formula for an organic chemistry exam question. Start with a straightforward reaction that students understand fairly well, like the Williamson Ether synthesis…. …now, just make a simple modification by adding one bond. Voila. Instant stumper! 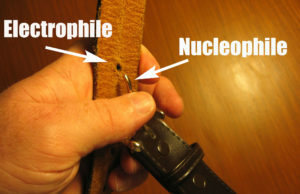 The second question above is an example of an intramolecular reaction, where the nucleophile and electrophile are on the same molecule, and the result of their reaction is that a ring is formed. In past posts on this subject, I’ve used the analogy of a belt. It still works. Why are intramolecular reactions good exam questions? Because they sort out the students who learn the reactions by memorizing a table of simple examples, and those who actually know (and most importantly, can apply!) the pattern of bonds formed and bonds broken. Furthermore, it involves no new concepts, which makes it totally fair game. Intramolecular variants exist for a lot of different reactions, and it comes up so often that it’s worth mentioning separately. 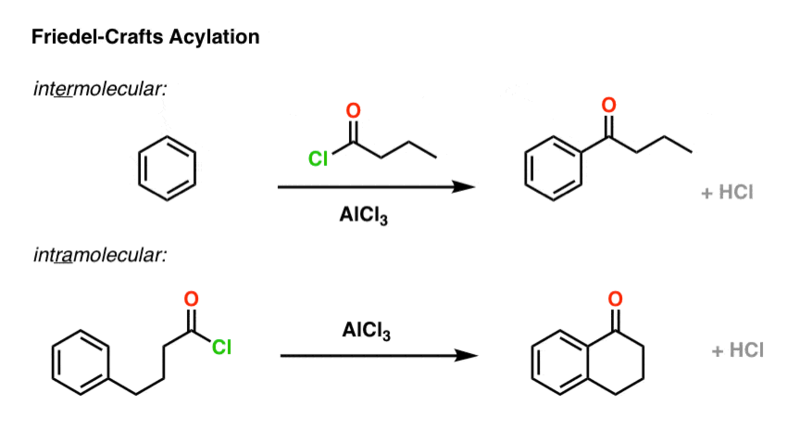 The Friedel-Crafts alkylation and Friedel-Crafts acylation reactions are no exception. Here’s an example of an intermolecular Friedel-Crafts alkylation. The nucleophile is the aromatic ring, and the electrophile is the alkyl chloride. Add a little catalyst (AlCl3) and boom! electrophilic aromatic substitution. Now let’s change things up just a little bit. We’ll attach the alkyl halide to the ring via a new carbon-carbon bond, and then add the catalyst. What’s the product? No new concepts! Same pattern of bonds that form and break. But if you haven’t seen an example like this before, it might throw you completely off your memorized notes. That’s the plan! [Cue recording of “evil laugh”]. OK. Here’s the mechanism, and the final product is drawn out below left. I want you to note that the overall pattern of bonds that form and bonds that break is exactly the same in the intramolecular case as it is in the intermolecular case, namely: form C-C and H-Cl, break C-H and C-Cl. number the carbons! it’s really easy “drop” a carbon in your drawings, and that will lose you points. draw the “ugly version” first, and THEN re-draw to make it look nice. Don’t worry about making it look pretty until you have drawn in the bonds that form and break. In the case of the Friedel-Crafts, the intramolecular version works best for making 6-membered rings, but it’s also possible to use the Friedel-Crafts to make 5- and 7- membered rings as well (not shown). 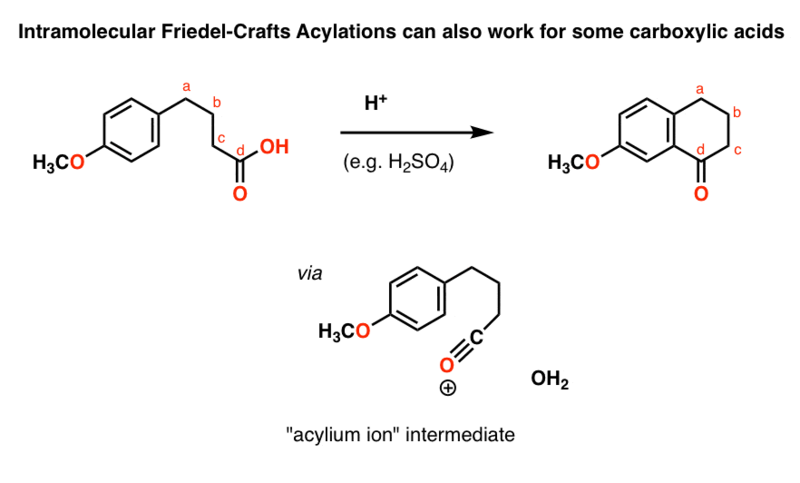 Once you’ve seen the intramolecular Friedel-Crafts alkylation, the intramolecular Friedel-Crafts acylation is not exactly going to come as a surprise. Again, I want you to verify that the bonds being formed and broken are exactly the same in each case. The only difference is that in the second case, the nucleophile and the electrophile are attached to each other through a tether. One reason why this works well for the intra- versus the intermolecular case is that the nucleophile is held so closely to the electrophile. This has the same effect as if the concentration of the electrophile was increased dramatically. You might see other examples where you can “get away with” using a poor nucleophile (or electrophile) in a given reaction if it’s done in an intramolecular fashion. Here’s a challenge question for you. 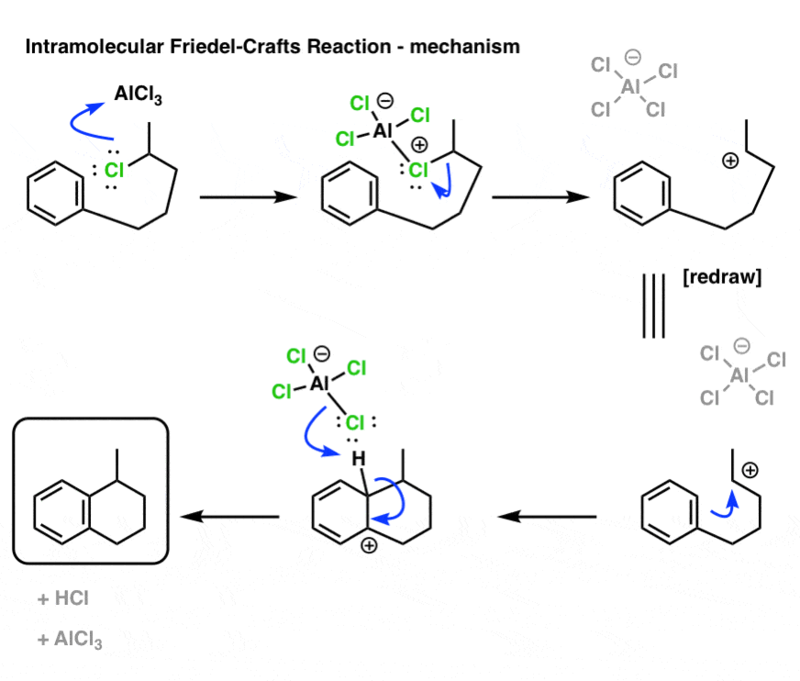 Can you draw the product of this sequence of Friedel-Crafts reactions? No really groundbreaking new concepts here, but it’s always helpful to keep alert for intramolecular examples of reactions. This concept never goes away. You will see it again! In our next post in this series we’ll cover a completely different class of substitution reactions on aromatic compounds that works well with electron-poor aromatic groups. It’s called Nucleophilic Aromatic Substitution. Rearrangement vs. ring closure. We’ve seen that primary alkyl halides can rearrange via hydride (and alkyl) shifts to give the “more stable” carbocation intermediates. So what happens when a primary alkyl halide is involved in an intramolecular Friedel-Crafts alkylation reaction? 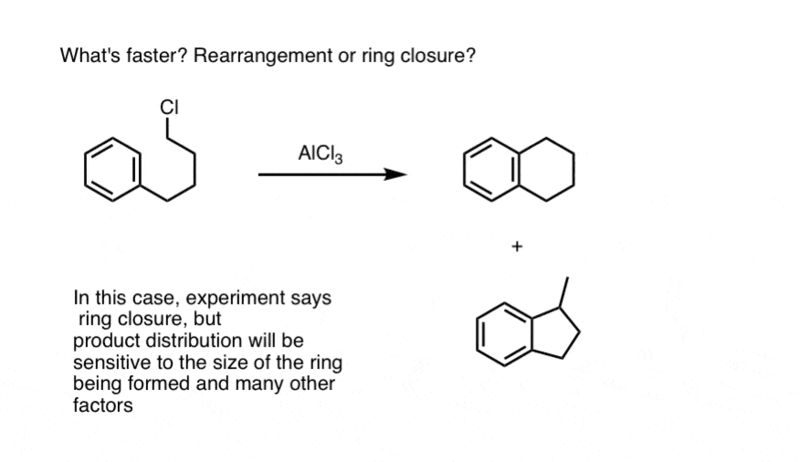 Does rearrangement happen first, or is ring closure faster? This is not the kind of question you can answer simply by thinking about it. When there are competing reaction rates, the only way to know for sure is through experiment. This was studied, and the full paper on the study of rates of rearrangement versus ring closure is here. [J. Org. Chem, 1966, 31, 89]. Would indicate that closure to the 6-membered ring is faster than closure to the 5 membered ring in this case. Yeah, that would definitely not win any fans. In practice problem #1 it appears that you changed the reactant from a seven carbon chain in the practice problem to a six carbon chain in the answer key. Shoot. Thank you Kirk, will fix. But an R group is an ortho para director, and the major product is para, so why isn’t it close and connect to the para position of the aromatic ring? The answer is that the para product would be very strained. The carbonyl can’t reach the para position in a way that leads to non-strained bond lengths and bond angles. If you are unsure about this I invite you to try to build a model! The article is very nice. I would like to know source or reference for the particular example where you intramolecular acylation of carboxylic acids as I have some confusion as to why the ether has not been hydrolysed. The reference is linked at the bottom, but it’s Organic Syntheses, Coll. Vol. 4, p.898 (1963); Vol. 35, p.95 (1955). What happens with the alcohol is that it eventually coordinates to AlCl3 which activates it towards attack by the aromatic ring, and it departs as a leaving group. Cation attacks meta to OCH3 group which is ortho para directing .It is not the major product. You are proposing that a seven membered ring would form containing a trans double bond. That is not going to be a stable molecule.